Although referencing other artworks is perhaps most closely associated with the post-modern practices of the 1970s – think Sherrie Levine and Richard Prince in particular – it’s a practice widely used in contemporary art. 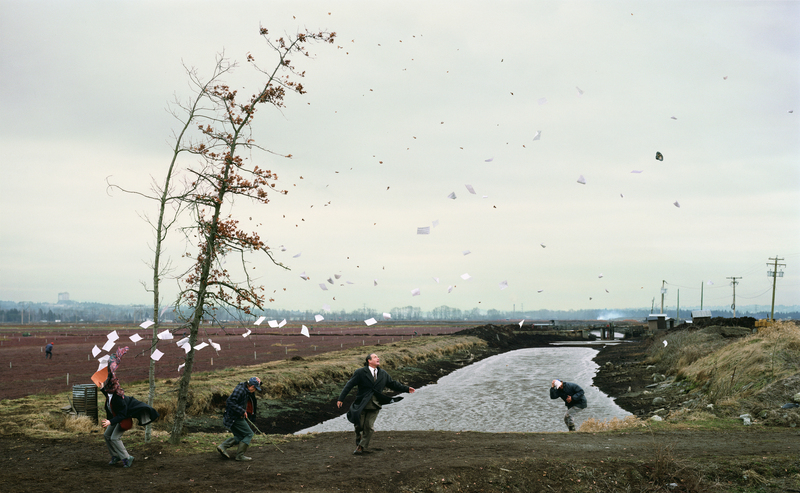 Jeff Wall’s large-scale photographic tableaux, many made in the 1980s and ’90s, could perhaps be seen as a kind of bridge between work that uses appropriation as a way to explore ideas about authorship – a key concern in post-modernism – and work that draws on art history and reworks it, perhaps in an attempt to understand the present by looking at the past. These works – shown as large light-boxes, a form that references advertising but also feels related as closely to cinema as to still photography without actually taking on the expected form of any of these – are both visually stunning and fascinating to look at; the detail is extraordinary and the scale – A Sudden Gust of Wind is roughly 2.5m by 4x – makes it possible to examine even the tiniest details. 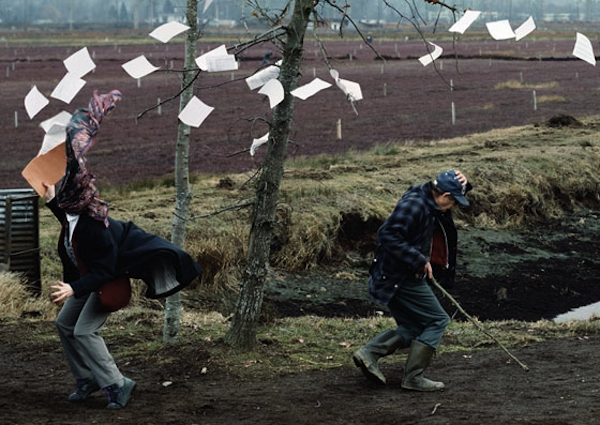 Though Wall continues to make engaging work, in my view his more recent work – which was one of the first things I wrote about here – isn’t as interesting as the earlier tableaux. The work is carefully constructed. Wall photographed different elements of the scene over a period of several months, before seamlessly collaging these together in digital post-production. It’s not clear what brings the four main protagonists to this place; two look dressed for the location but the other two look more like businessmen in their suits and overcoats. Whatever the contents of the file of papers, it seems likely that most will now be lost to the unexpected gust of wind that has also taken the Trilby hat of one of the men. 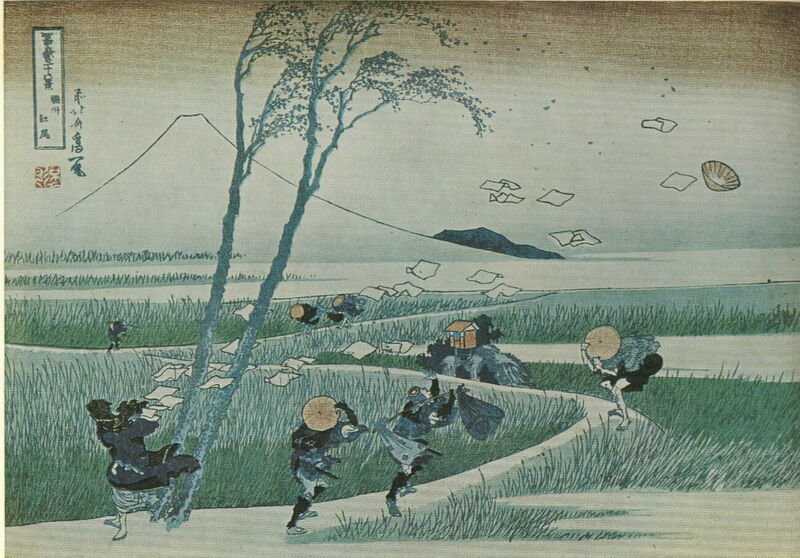 In the case of A Sudden Gust of Wind the source material is a Nineteenth Century Japanese woodcut, though Wall also references paintings from Western art history. In the main his use of historical source material is less obvious – and less precisely referenced – than is the case withA Sudden Gust of Wind. While most artists have a reasonable understanding of art history, Wall’s knowledge comes in the main not from his time at art school but from his doctoral research at the Courtauld Institute in London. It’s possible that it’s this more academic aspect to Wall’s background that makes his use of historical references more sophisticated than some; wall is responding to the works and relocating them in a contemporary context without necessarily retaining what might at first sight seem to the key components. The first picture Wall made in response to a historical painting – as far as I know, don’t credit me with either a huge amount of actual knowledge or the commitment to thorough research here, I’m more of an existing knowledge backed up by the occasional cursory google kind of person when it comes to this blog – was Picture for Women, made in 1979 and taking Édouard Manet’s A Bar at the Folies-Bergère as a reference point. Earlier paintings by Manet are often seen as the starting points for modern art and the painting is in the Courtauld collection, making it both an appropriate source for Wall and one he knew well. 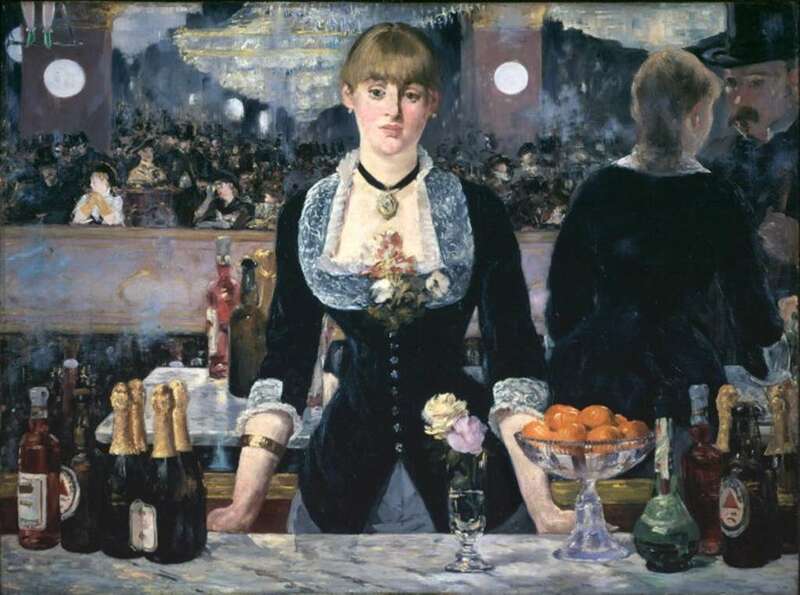 In Manet’s painting, the woman behind the bar takes centre stage – Wall describes her as being ‘in an everyday working situation which was also a situation of specularity’ – and the mirror behind her means we see her twice within the picture. The mirror is playing tricks through; the reflection seems odd, wrong even. 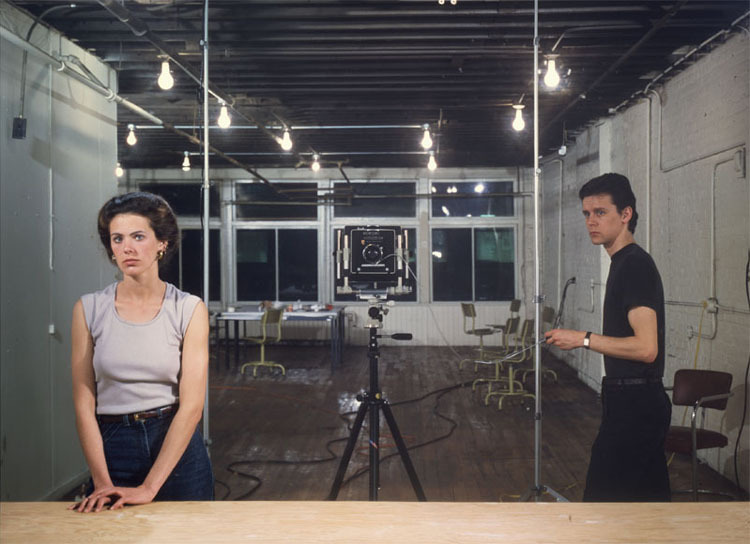 In Wall’s reworking, the woman is clearly the main subject but Wall himself is also present, along with his camera which makes the use of the mirror – and thus our role as spectator – all the more apparent. We are seeing only the reflection rather than the scene. There are obvious differences between Manet’s painting and Wall’s photograph, to the extent that one would be forgiven for not getting the reference – it’s certainly nothing like as close a reworking as A Sudden Gust of Wind (After Hokusai) but then the directness of that reference extends to the title – but the similarities are evident in the expressions on the faces of both the woman in the foreground and the man in the background. In both, the mirror plays an important role as a layer of confusion; it raises questions of spectatorship and of the gaze. And in both works the power dynamic between the sexes is being explored but in each in a way that is particular to the politics of the day. Picture for Women is a significant work in terms of the history of art photography, not least because it can be seen as a move from working in series to singular works. It carries many of the theoretical concerns that characterise art photography of the late 1970s and 1980s, in particular perhaps in terms of emerging feminist theory, concerns that deserve more attention than I’m inclined to give them here. Suffice to say that there is a lot of interesting stuff written about this work and anything I could add would be likely to miss the mark, so I’ll content myself with saying that for what is at first sight a fairly simple picture it’a actually a really complex work. And, having spent more of today than intended thinking about it, I now quite want to do some proper reading up on it. This entry was posted in Painting, Photography and tagged A Bar at the Folies-Bergère, A Sudden Gust of Wind, A Sudden Gust of Wind (After Hokusai), art, art history, Édouard Manet, Hokusai, Jeff Wall, Katsushika Hokusai, painting, photography, Travellers Caught in a Sudden breeze at Ejiri by Ann Jones. Bookmark the permalink. I love Wall’s reworking of the Hokusai.